Paul is a highly qualified and experienced financial planner who has particular expertise in the commercial and corporate sector having previously spent many years working in the Commercial environment for HSBC. 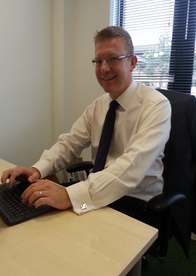 Paul says “The financial services sector has undergone much change in recent years and it is important that I can access services and products from the whole market to meet the needs of my clients who typically have sophisticated financial affairs. Vision’s philosophy and focus on high net worth clientele matches my client’s needs and I feel extremely confident that I have all of the tools that I require to provide my clientele with a first class financial advice service which is able to meet each client’s bespoke needs”. Paul has a philosophy that relationships must be built by putting his clients at the core of everything he does and as a result he has been able to build a very successful career as a high net worth commercial and corporate adviser. Paul feels that he is now in a position to provide a truly outstanding service to his clients and has recently been appointed as the preferred adviser to clients of MediciMarketing, a business which specialises in working with surgical and medical consultants. Outside of work Paul is married with three daughters. He is keen on all sports and is in the early stages of trying to master golf which is proving challenging! He would really like to have the opportunity to work with you in the future.